We hope to see each and every one of our favorite customers at our shows this year. It is a great time to catch up with all of you. Until then…be blessed!!!! What’s New at Snookie Snookerwitz? We’ve been staying busy here at Snookie Snookerwitz! We love each and every one of our customers, and you are worth every second we put into this business. We would just like to say how much we appreciate you. We hope that you have gotten to know us as a company and personally. We want all of our customers to feel like family here. As our business grows, we want to stay focused on what our goal was from the beginning, not only to sell a product, but to sell the experience and bring joy to each person that receives our products. We want to thank all of you who have been loyal customers, as well as those who have just recently heard about Snookie Snookerwitz. We have been updating on Facebook and Twitter, showing some of our favorite things on Pinterest, and we have more in store! We have big plans for the future and we hope that you will stick around and be a part of it! Spring is a busy time of year! It’s easy to get caught up in our daily routines. Between taking kids to school, running errands, school work and all of the other things we try to schedule into our lives, sometimes we need a break! We want all of our drinks and snacks to be the perfect break for you. After a long day we hope that a warm cup of one of our delicious drinks, or even a few bites of our tasty popcorn will brighten your day! With Mother’s Day right around the corner, our gift baskets full of goodies make great gifts! Show your mom how special she is to you. If you have several gifts you need to order, keep in mind that we have free shipping on all orders over $100! Graduation is also right around the corner, and if you know any college students then coffee is always a great gift idea! With tons of tasty flavors of coffees, teas, and cocoas, these make great graduation gifts! Don’t miss out on the deal we have! Now through May 11th use the promo code “mothersday” to receive 10% off of your purchase! Coffee and Cocoa gift basket. This cute basket includes a coffee book, two mugs and 3 bottles of coffee and cocoa! Makes a great gift for any family on your list this year!! 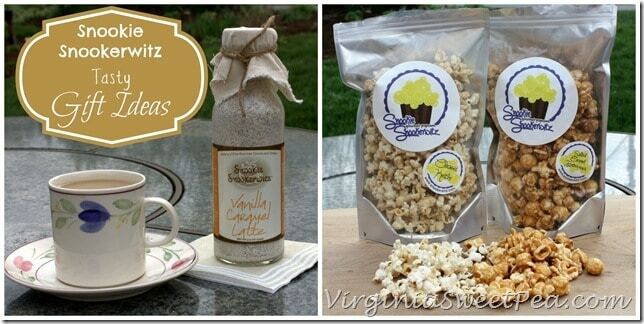 Local blogger Paula Skullina recently featured Snookie Snookerwitz on her blog virginiasweetpea.com. If you haven’t already, make sure to check out her blog for amazing recipes, DIY projects, giveaways and so much much more! In her blog she features many of our products and the different options that we offer! Paula features all of our popcorn, cocoa, coffee, ciders and teas in her blog showcasing the different flavors and varieties! For those who have never tried our products before, she does a great job of explaining our products. It is always great to get reviews from those who have tried our products! To read more please visit her blog at virginiasweetpea.com to read the full blog post as well as check out the great finds and ideas she has!